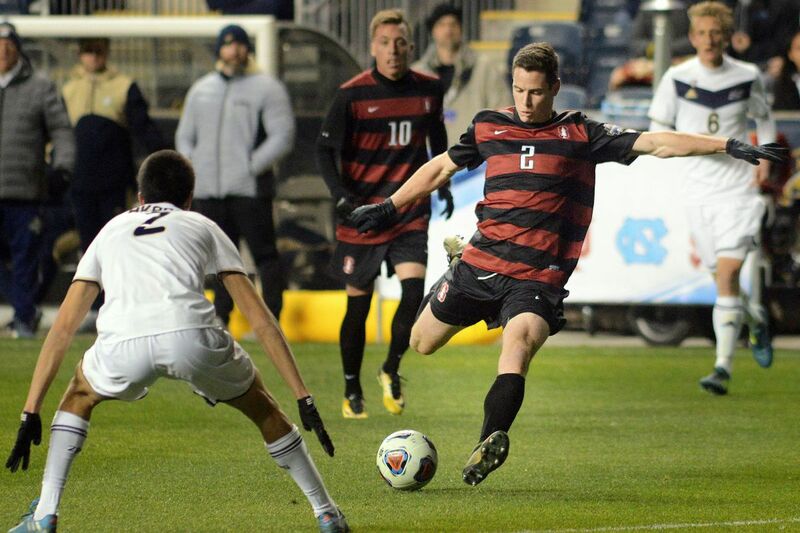 Stanford’s Foster Langsdorf (2) takes a shot as Akron’s Joao Moutinho (2) defends. Langsdorf scored the first goal of the 2-0 Stanford victory. The stage is set for the 2017 College Cup national championship. The final match of the current men's college soccer season will see two-time defending champion Stanford put its title on the line against blue-blood Indiana after each emerged victorious on Friday night. The Cardinal took the pitch at Talen Energy Stadium first, where they faced Akron in the national semifinals for the second time in three years. Like the matchup in 2015, it was Stanford that came out on top, this time by a score of 2-0. "As a coach, you'd be hard pressed to look for a better semifinal performance," said Stanford head coach Jeremy Gunn. "I thought our guys were magnificent tonight. … Our players were incredible just making life really tough for Akron. Until the second half, they just never looked comfortable. Meanwhile on the attacking side, I thought we were brilliant." For the Zips, the loss was a swab of alcohol on an open wound. "Obviously, it really hurts," said forward Sam Gainford. "We knew it was an opportunity to put that right from two years ago. Obviously it didn't go as planned and same result, so it hurts a lot right now." Stanford top goal scorer Foster Langsdorf opened the scoring midway through the first half when he buried a Corey Baird cross with a diving header. It was the first-team all-American's 14th goal of his senior campaign. "I wasn't thinking. Probably that's what helped," Langsdorf said when asked what he thought when he saw Baird's cross. "It was really just instinct." Stanford midfielder Sam Werner added an insurance goal 11 minutes from the final whistle with a rocket of a strike into the upper right corner. He took advantage of a slip-up in the back from the Zips — a downside of Akron's beautiful play style that reared its ugly head on multiple occasions Friday night. Cardinal goalkeeper Nico Corti shined in between his team's two goals, making two quick saves in succession at the height of Akron's pressure on his goal. "That was the moment we had the momentum and the chance to get back in the game, and it was a key one," Akron coach Jared Embick said. "I think we could have really rose to the occasion at that moment and who knows what could have happened." In the second game of the night, Indiana defeated North Carolina, 1-0, to advance to its 15th national championship appearance. Indiana's shutout was its 18th on the year, which ties the NCAA record. After a first half with little to speak of, Indiana emerged out of halftime with the momentum it built in the final 20 minutes of the first half. "We know on the backline, we're confident withstanding any type of pressure teams throw at us." said defender Grant Lillard. "Tonight was just an example of being able to grow into a game that didn't necessarily start the way we wanted it to. … We were able to take in some of their pressure and then figure out what we needed to do to adjust, and then we were able to execute a little better as the game went on." As halftime came closer, so, too, did Indiana to opening the scoring. The Hoosiers brought that momentum into the second half and used it to score the opening goal five minutes after the break. Left back Andrew Gutman sneaked up on the back post and tapped in a cross from Trevor Swartz off a corner kick past UNC goalkeeper James Pyle. "Trevor and I mess around in practice," Gutman said. "After practice, he does corner kicks, and I kind of just do crazy finishes with them. … I would say that's how I was able to keep my eye on it. We just do that every day in practice. It was a great ball, and I just put my foot on it." The Tar Heels fought for the equalizer for the remainder of the match and came close, but Indiana goalkeeper Trey Muse stepped up with two massive second-half saves. Both Indiana and Stanford enter Sunday's title game with aspirations of making history. The Cardinal can become the first team to win three straight national championships since Virginia won four consecutive titles from 1991-94. Meanwhile, a victory for the Hoosiers would push their title count to nine, moving them within one from Saint Louis for most all-time. "I think people might think because we've been here for the past three years in a row, that it's easy," Stanford's Corti said. "We know how difficult it is. We know how many things can go wrong and so to take care of business and get back there again with all the same guys, I think that's special, and we're very excited. … We're going to do everything we can to come out with the title again." "Coming here to Indiana, you know about the history and tradition, so having the opportunity Sunday to add to that tradition is unbelievable," Indiana's Lillard added. "We get to play against Stanford, the two-time reigning champs so you got to beat the best to be the best. It's going to be a fun matchup."